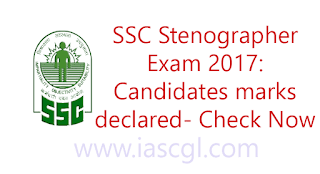 Staff Selection Commission released score card for Stenographer (Grade C and D) written examination 2017. The Computer Based Test(CBT) was held from September 11 to September 14 at various centres across the country in which 2,24,618 candidates appeared. Candidates can check their score card for the same, from the official website of SSC at ssc.nic.in or from direct link given below.